These days, it seems like September is the new January. This idea may stem from the fresh start that comes with the new school year. Perhaps it's the cooler temperatures that bring closure to the long, sunny days of summer as people ready themselves for new projects, beloved traditions, and the upcoming holiday season. If you like to set seasonal goals or if you are looking to create new traditions, here are a few ideas you can add to your list. Make some hot spiced or mulled cider, or try an apple sangria. Sign up for a fall road race to run or walk, or organize a team with your friends and do a charity walk. Dig out your crockpot and experiment with some new recipes. Go to an agricultural or fall county fair. You can search for one near you here. 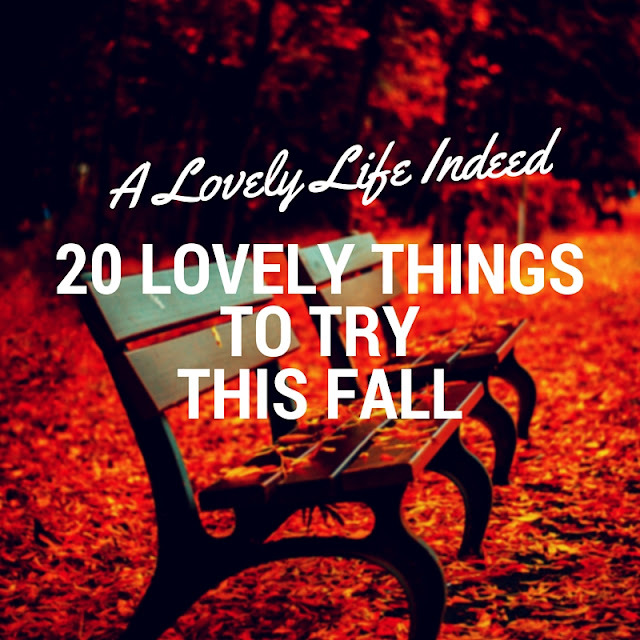 Go apple picking and pumpkin picking. Apple crisp and roasted pumpkin seeds for all. Host a chili cook-off or a pumpkin decorating party capped by a cozy fall fire. Organize a fall food drive or a winter coat drive. Try a share in a fall or winter CSA. Go on a full moon hike or go for a walk in the woods. Plan for a weekend away in case you hit the winter blues. Host a football party or a football widows' party. Visit a small town bed and breakfast and wander its town's main streets and back roads. Read a classic book you never read in high school or college. Try a ghost tour or haunted attraction. Check Groupon or Goldstar for deals. Plant bulbs now for a pretty spring landscape. Learn how to roast vegetables. Fall can be as much of a time of renewal as the New Year. How do you mark the transition from summer to fall? Share your favorite fall traditions. I agree! I love Fall and it always feels time for a fresh start. I guess it does go back to school days. I like to try some new recipes, host friends for dinner, do a fall cleaning/purging like I do in the spring, and get out to see some new things in town. Hello Kelly, How 'Lovely' it is to see your Post up on your many Lovely ideas of things to do in the fall! Fall is indeed a new beginning, although I am admittedly hanging on to the final abundance of summer for as long as I can. The Farmers Almanac is calling for another rough winter ahead... and though I enjoy all the seasons... last year was too long. We shall be apple and pumpkin picking shortly ahead, at least after a Tailgate round this weekend. So great to see you. So many great ideas! I do plan on going apple picking. A chili cook-off is always fun too. A nice trip away in the colder months is a great idea! Seasonal goals are always fun. I love the idea of a clean slate. I am off to explore Luray Caverns. I am not familiar with it, and we are always looking for somewhere new to go. Thanks so much for the idea! Seasonal goals are always fun. I love the idea of a clean slate. Fall cleaning and purging feels great! Thanks, Brenda! What seasonal goals are on your list? Seasonal goals are always fun. I love the idea of a clean slate. What is on your list, Rena? so many awesome ideas! Thanks for sharing these :) I plan on doing a 5 or 10 k this year as I like to do one a year, at least, and trying new soup/stew recipes, lots of pumpkin spice, and I'll be trying to plant a garden this year and going apple picking!